Clive Swansbourne, piano and speaker. Unlike the other more specific talks in the Enlightened Listener series, which are available only as downloads, this substantial introduction is available either as a download or as a double CD album. 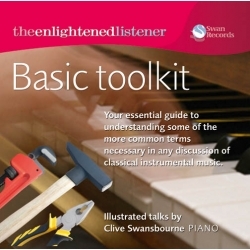 The Enlightened Listener’s Basic Tool Kit is designed to help listeners understand some of the more common terms necessary in any discussion of classical instrumental music. Clive Swansbourne discusses each of these terms, grouped under major headings such as melody and harmony.